Chocolate crust and a decadent chocolate filling, going all the way! Preheat your oven to 350 degrees F. In a blender or food processor, crush the Oreos until fine. Add the melted butter and process until just moist. Transfer to a 9-inch pie plate and press to line the bottom and sides. (Tip: Use a 1/2 cup dry measuring cup to help press the crust evenly up the sides of the plate.) Bake for 7 to 8 minutes. Remove from oven and allow to cool on wire rack. Whisk together the sugar, cornstarch, unsweetened cocoa powder and salt in a medium bowl. Add the whole egg, egg yolks, and 1/2 cup of the milk, then whisk until incorporated. In a large saucepan, bring the rest of the 1 1/2 cups of milk to a boil over medium-high heat. Immediately remove from the heat and pour the hot milk into the egg mixture in a very thin stream, whisking constantly to avoid scrambling the eggs. Scrape the mixture back into the saucepan and heat over medium heat, stirring constantly, until it returns to a boil and the mixture thickens, about 5 minutes. Remove from the heat again, add the chopped chocolate and let it sit in the mixture for 1 minute before stirring. Add the butter and the vanilla, then whisk until the chocolate is completely melted and the filling is smooth. Pour the filling into the cooled crust-lined pie plate and use a rubber spatula or wooden spoon to smooth it out evenly. Cover with plastic wrap, making sure the plastic is flush to the surface of the filling in order to avoid a film developing on top. Refrigerate for at least 2 hours (I prefer at least 4 hours to ensure it is completely cold and set). 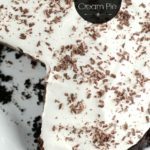 When ready to serve the pie, make the whipped cream topping. Beat the whipping cream in a large bowl with an electric mixer until soft peaks almost form. Add the powdered sugar and vanilla, then continue to beat until soft peaks form (thickened to the consistency of whipped cream). Spread evenly over top the pie. Garnish with additional crushed Oreos or chocolate shavings.